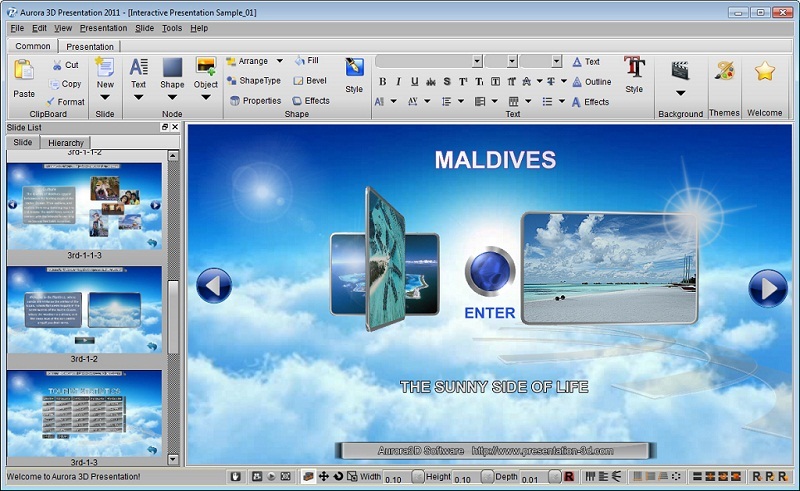 Aurora 3D Presentation 2011 - Easy interactive 3D presentation software. Easy interactive 3D presentation software. When you want your audience to truly be interested in your material, you don't try to get your message across in mere words! You use snappy graphics, and charts, and images! But instead of juggling a smorgasbord of presentation applications for different uses, why not just consolidate all of your presentation magic-making into Aurora 3D Presentation? Aurora 3D Presentation gives you access to powerful techniques that you can harness to develop impressive, professional, and effective presentations in a number of formats! With Aurora 3D Presentation, you'll be able to produce solutions that incorporate images, text, video, and data in a way that will capture the attention of your audience. Even if you aren't very creative, it's easy to get started with Aurora 3D Presentation, thanks to the included templates and styles. So, what can you do with Aurora 3D Presentation? How about an interactive menu that automatically launches slideshows, websites, or executable programs? Or a wall of pictures and information, arrayed in a circle or a gracefully curving animated arc around the viewer? Spice up those boring spreadsheets by importing CSV files into Aurora 3D Presentation and animating tables and data, or create animated charts and graphs, even 3D models! Everything that you could ever ask for in a presentation product is here with Aurora 3D Presentation! Import images, create albums, use 2D and 3D text for impact, and play around with special particle effects and backgrounds! There's no limit to your creativity with Aurora 3D Presentation!